To see whether there is anything of interest on these 2 CD's, try entering a search word in the search box, and then press "Go!" I was a boarder at Steyning Grammar School from 1959 to 1966. My memories of schooldays are mixed, with many good memories but some less so. I suppose it's only now looking back that I can appreciate what I gained. In fact, it wasn't until I read George Barker's "The Slog Smugglers" that I recalled so many of the very funny things that happened there. I went back to Steyning in the middle of 2005, and took this photograph of the front of the school. 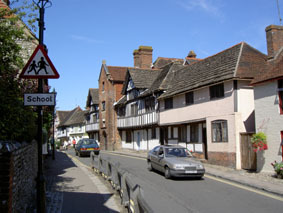 The hanging tiles that used to face the building have been removed, revealing a very attractive half-timbered frontage, but otherwise the school is very much as I recall. Except that no-one wears caps any more. After reading his book, I got in touch with George to discuss the possibility of putting together a CD of photographs, magazines, and so on, which otherwise get locked way in attics. He had been given a lot of 'ephemera' and was wondering what to do with it. Hence this CD. My thanks go to George Barker and Roger Tilbury for making this CD possible. We have done our best with the photographs to match names to faces, but many remain to be identified, and no doubt some are wrong. George Barker has numbered each of the school photographs, and Roger Tilbury has collated the names against these identification numbers - and you can help us by filling in the gaps and telling us where we have made mistakes. My hat off to both of them for persisting with such a mind-numbingly boring task. Around 25 Old Boys were casualties in each of the two World Wars. "The outbreak of war in 1914 saw a vibrant but comparatively small school. At 11am on the 11th November 1918 the guns fell silent. "The War to end all Wars" had finally ended with a tremendous toll in life and suffering across the whole country. Virtually all Steyning’s Old Boys of military age joined up and although our casualties are probably light in comparison with some schools, the twenty-five listed is still a substantial percentage of those passing through the school. 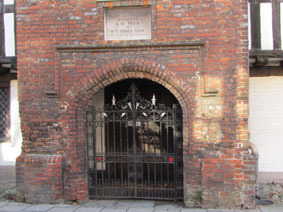 Wrought Iron Memorial Gates were erected in 1923 to commemorate the SGS Old Boys who had made the ultimate sacrifice (see picture at right). Fifteen years later the world was at war again by which time the school had grown in size to around 200 boys and so, although the number of casualties from each war is roughly the same, the percentage for WW2 is a lot lower, there being less pressure on people to enlist and with conscription from the beginning there were more rigorous checks on health and age. The large numbers of underage volunteers (around 250,000) in WW1 was not replicated in WW2." On this CD the names of the old boys who were casualties are named, and a short biography is provided. Where we have them, the text is illustrated with photographs. This CD was compiled by Roy Winton, and edited by George Barker.